JIC, Sim and Steffi were coming today. It’s a long drive for them and a long wait for us. After a morning spend tidying up, Dysoning, dusting and generally making the place spick and span, we headed out in the rain to Kirkintilloch for lunch at Calders garden centre. Lunch was fine, better than a lot of places we’ve been to recently and afterwards we had a walk round the plants while the rain thumped down on the roof of the covered area. We also ventured out in the rain to rove further into the plant area. I was impressed with the way the place was set out, with very few single species arrays beside other single species arrays. Instead, most of the displays were of mixed plants, different colours, different textures and varying heights. Now that’s a refreshingly different way to show off plants. Not so good if you’re searching for a specific plant, but if you want to see what plants complement others, it’s a great idea. Unfortunately, we weren’t looking for plants today. I was looking for a new coarse rose for the watering can, specifically one that could be used to water in the nematodes I’d received in the post this morning. We found lots of ornaments, cards, books, scarves, mottos and pictures, none of which I would have in the house and none of which would be at all good for watering in the nematodes. That’s the big problem with garden centres. The outdoor part may have plenty of plants, but the indoor section is jammed full of tat! Came home in sunshine, roseless. Then Scamp offered an old watering can with a fairly coarse plastic rose. I decided it might just do and if it didn’t, I could drill out a few of the holes with the power drill. I was right for once. It was almost coarse enough, but after drilling out most of the holes with a power drill, it was fine for the job. Or should that be coarse for the job? With the nematodes now burrowing deep into the soil to find some tasty vine weevil grubs, my work was done for the day. After a cup of tea I grabbed my camera and went in search of some photos in St Mo’s. 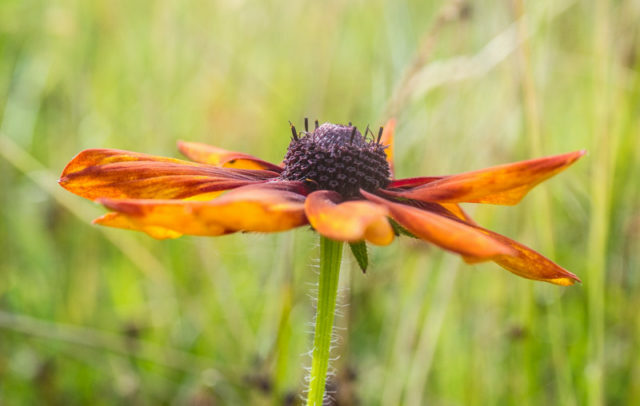 Found Mr Grey close enough to photograph, some ‘beasties’ and also some Rudbeckia flowering in the wild garden that volunteers planted a couple of years ago. The Rudbeckia won PoD, just like it did last year!! Finally at about 7pm the visitors arrived and we spent the rest of the evening eating, drinking and talking. Just really catching up. Scamp spent a short time showing off our garden front and back and we admired the veg that JIC and Sim had brought with them. Tomorrow they go to Stirling Castle and Wallace Monument and we may go to Embra.